1. Cut a heart template on a piece of paper, try folding a 10cm piece of paper in half and drawing half a heart , cut this out and when opened up you will have a perfect heart shape. 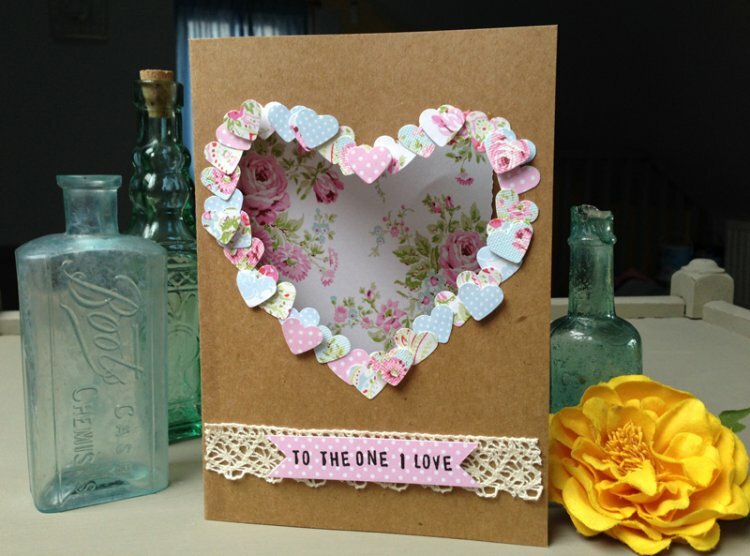 Draw the heart onto your card and cut out with a craft knife. 2. Cut a piece of floral card 12 x 17cm and stick to the inside of the card blank. 3. Punch out mini hearts from your chosen paper, we used First Edition Floral Pavilion, stick them around the outside of your cut out shape, when you have surrounded the cut out, stick some hearts on top using foam squares to add depth. 4. Stamp your sentiment on patterned paper and cut out, trim the edges to double points. Cut a strip of lace ribbon and stick to the bottom of your card, add the sentiment on top to finish. Do you like this project then tell us below, we would love to hear what you are making for Valentine’s Day, you can also share it in our project gallery.